Treasures Found Estate Sales LLC is a team of sales professionals with experience, strong work ethics and successful sales records. We are dedicated to customizing the estate sale to your individual needs with personalized and caring service for you. We are committed to providing a friendly and organized sale with maximum results. Honesty, integrity, reliability and confidentiality are first and foremost in our business. We take great pride in preparing your sale of family treasures that have accumulated through the years. We treat each home and family with a personal touch as if they were our own. Our goal is to give you the smoothest transition possible. We understand and are compassionate with the emotional challenges and pressure life’s changes can put on a family. We strive to take the stress out of a difficult situation when it is sometimes overwhelming and you do not know where to turn. Whether your estate sale is big or small; you are an estate executor, estate probate lawyer or realtor involved in settling a family estate, foreclosure or liquidation; you are retiring or downsizing, relocating and selling your home to relocate to another part of the country; divorcing or are a surviving spouse, helping an aging parent with a transition into assisted living, or simply redecorating, we will take care of every detail of your estate sale from start to finish. We are a one step estate service solution with one commission that includes everything. We have no minimums or extra hidden charges beyond our commission. We enjoy preserving your treasures from the past and passing them along to those who will appreciate them for years to come. We sell household items, clothing, jewelry, furniture, appliances, antiques, garage items, basement items, outdoor items, cars, boats, and just about anything you can think of. We efficiently clean, sort and organize all items, then stage, research prices, and price your items to maximize a fair market sale price. We provide tables, small item display cases, cleaning and packaging supplies and everything needed for the estate sale. Your sale will be advertised online and through our customer database of loyal customers who want to be notified about our upcoming sales. 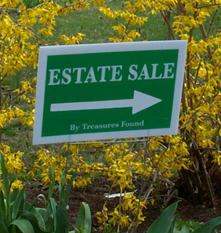 We provide our “Treasures Found” signage which is strategically positioned in the surrounding areas of the estate sale during the days of the sale that directs people that are coming to the sale and also helps to bring people to the estate sale that didn’t know about it. Ultimately we want to assure the best presentation of the goods being sold and get the best current market price for your treasures. Presales of large items begin prior to the estate sale. We photograph, advertise, and sell these items online in advance of the sale days. We manage the parking and crowd control on the days of your sale and appropriately staff the sale at key points in the house. Ultimately we want to assure the best presentation of the goods being sold and get the best current market price for your treasures. We service the Fairfield County area including Darien, Easton, New Canaan, Norwalk, Weston, Fairfield, Greenwich, Ridgefield, Westport and Wilton. Are you feeling overwhelmed? Don’t know where to start? You can relax and have all the work done for you. We would love the opportunity to discuss the specific service needs for your upcoming transition. Please give us a call or e-mail us today to set up a no cost convenient time that we can discuss your need and requirements. © 2013-2019 Treasures Found LLC. Website developed and maintained by Rivard IT Solutions.